Last month, Kate Macdonald Butler, Elizabeth Epperly and Kate Scarth visited the L.M. Montgomery Public School in Charlottetown because the students had created art inspired by Montgomery's legacy. Today, Kate S. reports from the field about what happened that day, the project and much more. Some grade 5 and 6 students at the L.M. Montgomery school in Charlottetown have been busy. 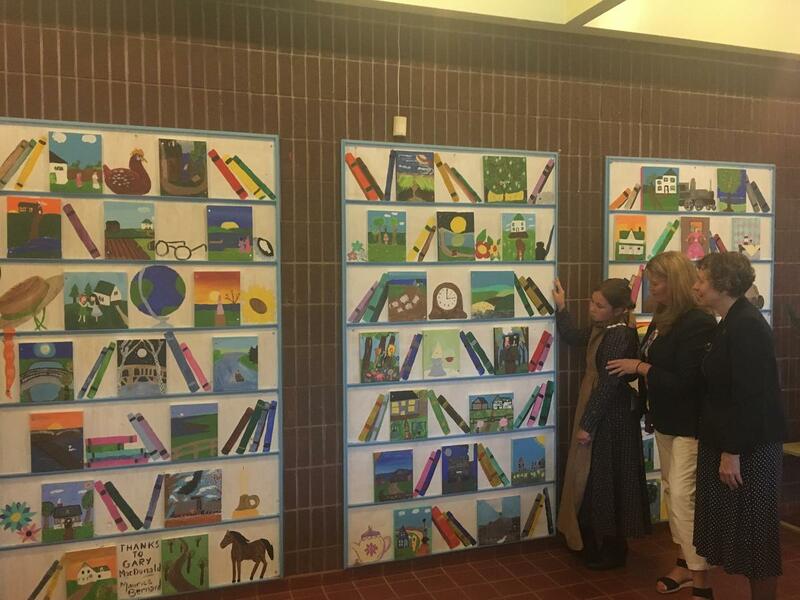 Anyone entering their school is now greeted by the students’ artwork commemorating Montgomery’s most well-known work, Anne of Green Gables. The students have spent the year learning about this piece of PEI history with national and international importance and have picked up literary and artistic skills along the way. This project happened through a PEI Arts Smart project, a partnership with Island artist Maurice Bernard, and with support of the L.M. Montgomery school and its staff members Cyndi Proude, Maureen MacBeath, Nancy MacKinnon, Heather Cudmore, and Denise MacDonald-Vail. L.M. Montgomery students now know more about PEI’s most famous and beloved author. The students have also created a lasting celebration of Montgomery in the school bearing her name. On June 25, Montgomery’s granddaughter Kate Macdonald Butler, L.M. Montgomery Institute founder Betsy Epperly, and I attended an assembly at the L.M. Montgomery school which honoured Montgomery. Macdonald Butler told stories about growing up as Montgomery’s granddaughter, Epperly read from her children’s picture book, Summer in the Land of Anne, and I read from Anne of Green Gables(specifically, the “slate incident”!). We were delighted to see the students’ learning and excitement on display. The choir opened the session by singing “Gee I'm Glad I'm No-One Else but Me” from The Charlottetown Festival’s Anne of Green Gables: The Musical. Student Madison King read her biography of L.M. Montgomery, then another student, Nik Neitz, described the students’ process interpreting Anne of Green Gablesand painting the panels. The students kept journals of their experience, and Gabby Paquet’s and Liam Corrigan’s were shared at the assembly. Thanks to the staff and students of the L.M. Montgomery school for their role in preserving Montgomery’s legacy! 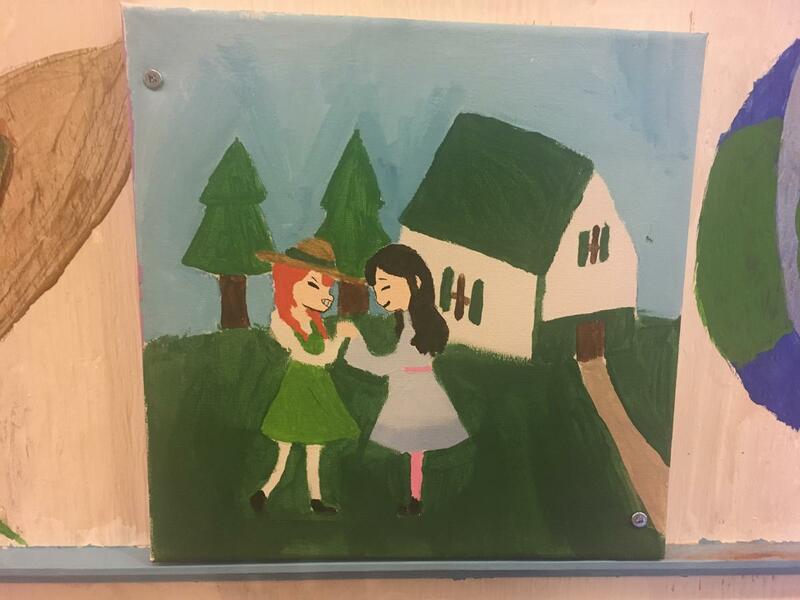 Painting: Anne and Diana in front of Green Gables.